A Saudi teen who was granted asylum in Canada after fleeing from her allegedly abusive family has arrived in Canada. 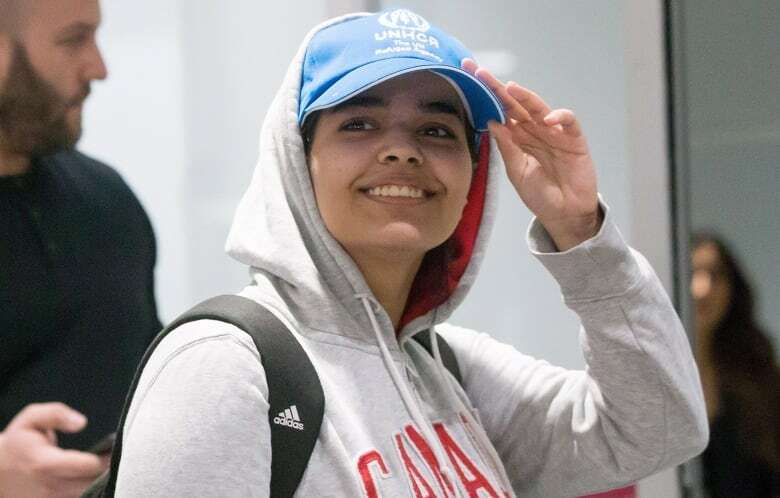 Her flight from Seoul, South Korea, landed in Toronto a day after Prime Minister Justin Trudeau announced his government would accept 18-year-old Rahaf Mohammed al-Qunun as a refugee. Al-Qunun, wearing a hoodie emblazoned with the word Canada, waved to reporters as she walked through Toronto's Pearson International Airport. She was accompanied by Foreign Affairs Minister Chrystia Freeland, who said al-Qunun will be going to her unspecified "new home." "She is obviously very tired after a long journey. And she preferred to go and get settled," Freeland said of al-Qunun, who declined to speak to reporters. Al-Qunun did, however, take some time to pose for photographs with Freeland. "She wanted Canadians to see that she's here, that she's well and that she is very, very happy to be in her new home," Freeland explained. Al-Qunun says her father physically abused her and tried to force her into an arranged marriage. "I'm the girl who ran away to Thailand. I'm now in real danger because the Saudi Embassy is trying to force me to return," said an English translation of one of her first posts to Twitter. The teen also wrote that she was afraid and that her family would kill her if she were returned home. Trudeau announced Friday that the United Nations High Commission for Refugees asked Canada to take al-Qunun as a refugee, and Canada agreed. UNHCR spokeswoman Lauren La Rose praised Canada's willingness to step up and assist in this case, but noted that al-Qunun's situation highlights a need for more interventions around the world. COSTI, a Toronto-based non-profit that helps newly arrived immigrants and refugees, will assist al-Qunun as she adjusts to a new life. As a government-sponsored refugee, she will have access to government assistance for up to 12 months. "This is a young woman who is determined to make a future," said Mario Calla, executive director of COSTI. "It's not going to be all smooth sailing for her, when one considers the fact that she has had to leave her family, to leave a familiar culture and social connections. It's not going to be an easy process for her," he added. According to Calla, al-Qunun has some contacts in the city and has reached out to them. On Saturday afternoon, she went shopping to buy winter clothes. In the coming days, representatives from COSTI will help her open a bank account, apply for a social insurance number and obtain a health card, Calla explained. Then they will try to find her permanent housing. Calla said he's not sure if she intends to stay in Toronto in the long term. For now, al-Qunun is staying at a facility that has security guards present at all times. "We have advised her to be careful about disclosing her location. She's taken a position in terms of leaving Saudi Arabia where some may disagree with her and may have strong opinions about that. We're being careful to protect her from that," Calla said. He added that there may be an increase in asylum seekers using social media as a tool to reach out to governments and agencies to make their case for being granted asylum. "There are many, many people in desperate situations — desperate in the sense that their lives are in danger. They will do anything to get out of those situations to safety so it may be a tool that some will use," he said. The move to accept al-Qunun could serve to heighten tensions between Canada and Saudi Arabia. In August, Saudi Crown Prince Mohammed bin Salman expelled Canada's ambassador and withdrew his own envoy after Freeland used Twitter to call for the release of women's rights activists who had been arrested in the country. Freeland echoed that sentiment in comments to reporters Saturday. "It is absolutely the case that there are many women, far, far too many women, who are in dangerous situations both in Canada and around the world," she said. "But rather than cursing the darkness ... I believe in lighting a single candle and, where we can save a single person, where we can save a single woman, that is a good thing to do." However one former diplomat questioned the Canadian government's actions in this instance, saying it sets a "very dangerous precedent" for future cases. David Chatterson served as Canada's ambassador to Saudi Arabia from 2009 to 2011. "What happens the next time a teenage girl or adult woman from Saudi Arabia that flees her family and declares herself to no longer be a Muslim, does that mean automatic sanctuary? One would almost conclude so from the actions taken in this case," he said in an interview with CBC News Network. He added that the normal process of assessing a refugee claim can take several years in Canada. "All of that was sort of set aside" in this case, Chatterson said.